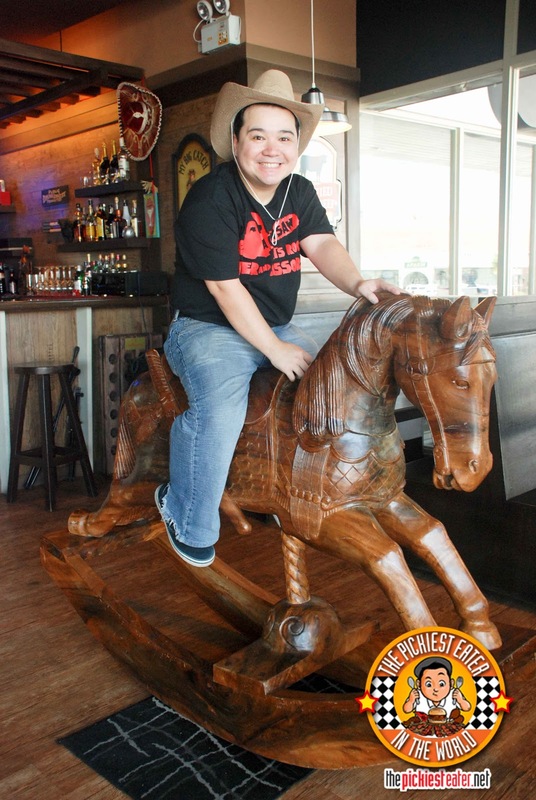 THE PICKIEST EATER IN THE WORLD: I'M ON A WOODEN HORSE.. STEAK HOUSE! I'm a very lazy guy, that struggles to get himself out of bed or away from the computer when at home. I'm a homebody that prefers a large order of pizza and a good movie or series marathon, as opposed to a partying at bars and clubs all night. I've noticed most of my posts have been either Eastwood or Makati (I live in Pasig and I work in Makati), so I decided to expand my horizons just a little bit, and explore what lurks in Alabang (I told ya just a little bit). When Rina told me that her friends were planning a get together down South, I jumped at the chance to go on a food trip with them. 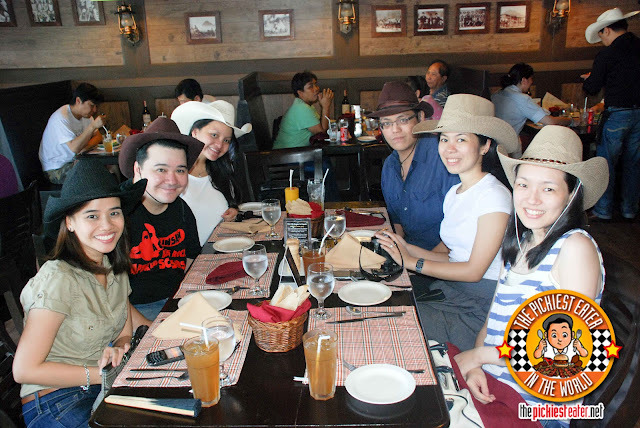 At first we were planning somewhere in BF Homes Paranaque, but when I realized that the get together was scheduled on a Harry Potter weekend, I thought it would be best to have lunch somewhere in Alabang Town Center, so that Rina and I could go straight to their cinemas right after. I was able to get some great seats via SureSeats.com for the 4:30pm showing (And it's a good thing I did, because the line was ridiculous and by 1pm, they were only selling tickets for the last full show! ), leaving me with only one problem.. where to eat at ATC. It's a nice mall and all.. More like a tidied up Glorietta in Makati, but the choices of restaurants aren't anything out of the ordinary. I didn't want to make that rare trip to Alabang, and just eat at Pepper Lunch, Yellow Cab or Italianni's again (Their concession stands are more interesting then their actual restaurants). I resolved that since we went all this way, our meal had to be something different. Rina's friend Lia, who is a resident of the South and has joined us in many adventures in the past, always boasted that once we visited Alabang or any of her "Territories", she would be the one who would play hostess. It was funny because once we got there, she herself found herself a little lost in the labyrinth that is Alabang Town Center. Then came Rina's friend Aiko, who herself is a citizen of the South. She suggested a restaurant that I haven't reviewed yet, and we decided on that. However, I was a little bit uneasy because I knew there were other branches of that said restaurant in Makati and MOA as well, so I really wouldn't be maximizing my trip. But at that point I was just so exhausted from walking I was thisclose to picking the nearest BBQ stand and just going with it. 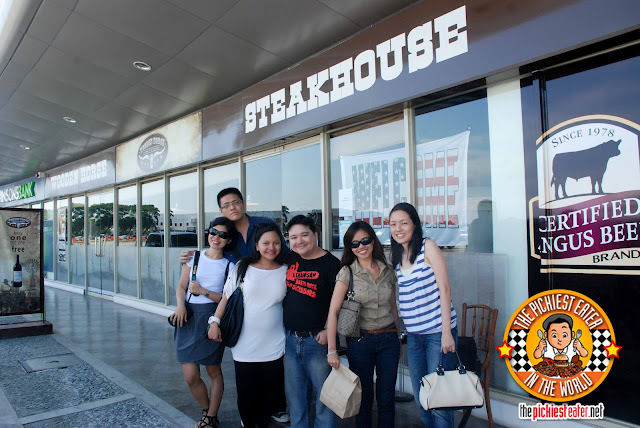 The place she took us to was actually across from the Alabang Town Center, and as we got closer, Aiko pointed out a Steak House, which was right beside the diner she initially suggested. Since I had never heard of this place before, I knew I had found the restaurant I went down to the South for. 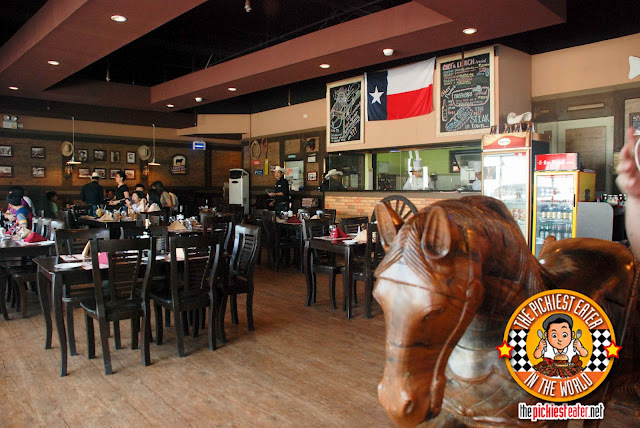 The Wooden Horse Steak House. Holy crap, was that a long intro or what? The place looked more like a minimalist cowboy saloon, unlike the over the top Texas Road House Grill whose design embodied the phrase, "Everything is bigger in Texas". 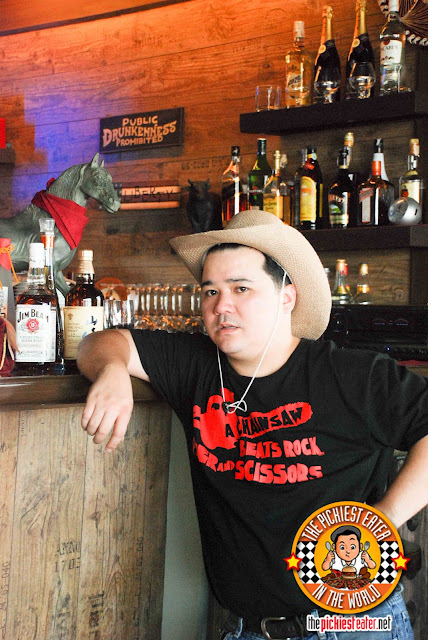 It definitely gave you that Cowboy vibe, without taking you on a too far back trip to memory lane. It had the little touches of the Old West (like the old Photographs on the wall of Wild Bill Hickock, and the lassos, etc), brought into the modern world. 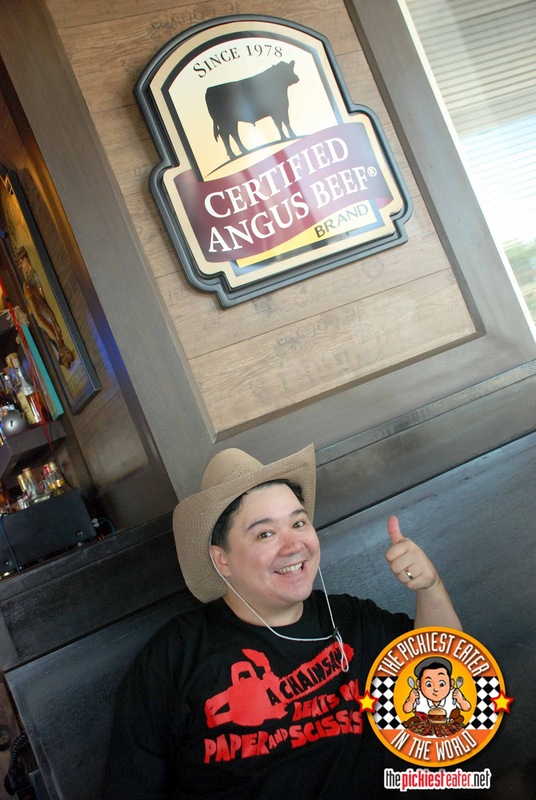 The service was excellent, with our waiter, Gerald, very warm and accommodating, and seem intent on making sure we enjoy our experience of the Wild West. They even lent us some Cowboy hats for the picture taking (and they were the ones that urged me to ride the horse.. their fault, not mine). 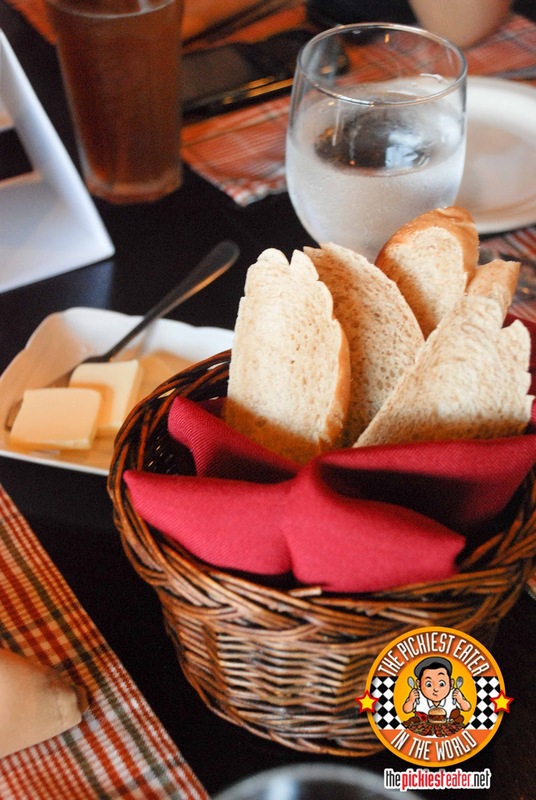 I'm not too sure what kind of bread this was that they served as our "Starter". It looked like French bread, but the texture and color seemed more like wheat. It was nice and soft though, and went perfectly with the butter. I just wish it was hot when it got to us, though. 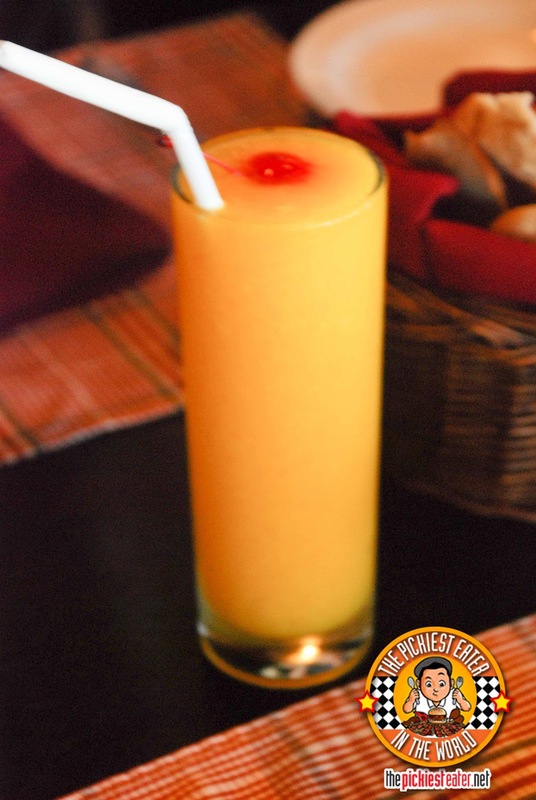 Rina once again ordered her mango shake. She finished it within minutes of ordering it, even before the food arrived("It's so hot kasi eh!" was her reason), so I'm pretty sure she liked it. (To be honest, I don't even remember seeing it on the table). Melay ordered their onion rings, funnily enough, AFTER everyone was almost done eating. As soon as I tried a piece, it made me wish she ordered it a little bit earlier, when I wasn't so full yet. The lightly covered battered had a subtle peppery flavor to it that perfectly complimented the deliciously sweet and juicy onions. 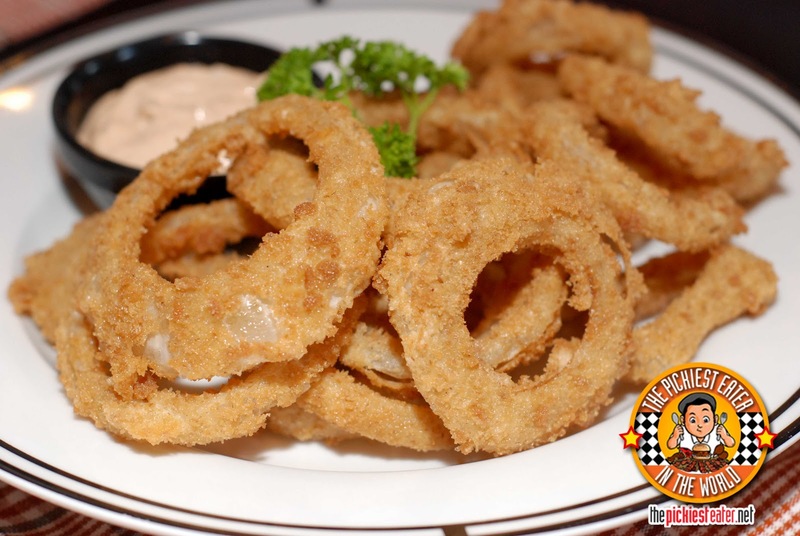 With or without the dip (It seemed like mayo with a little Tabasco), the rings stood on its own. After a reasonable wait that seemed shorter than it actually was because of the hilarious conversations, the main event finally arrived. 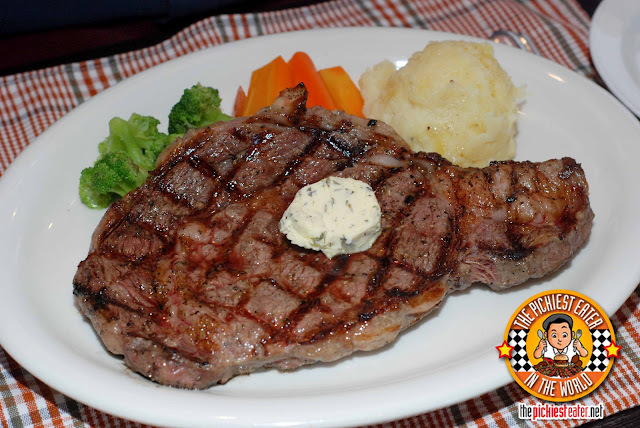 My friend Jorel is a big, beefy guy, so it came to no surprise that he ordered the 10oz Rib Eye Steak (P1,320.00). 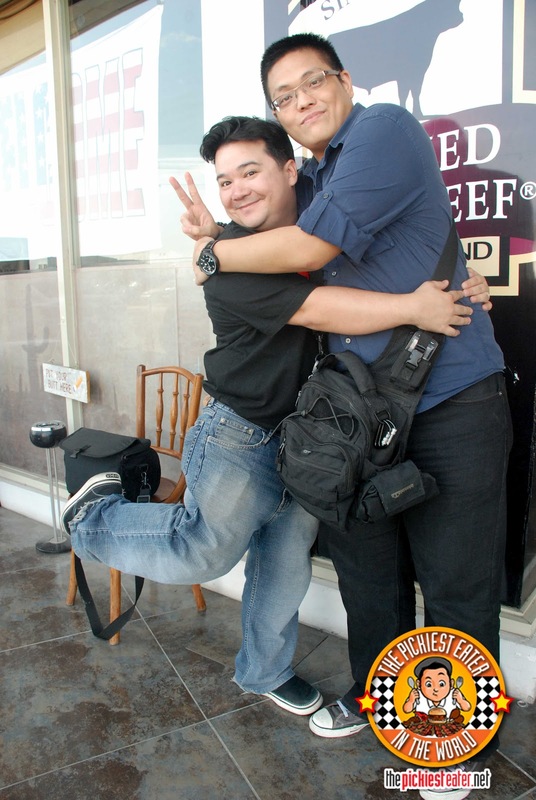 I'm a bit smaller than him (Fine, A LOT smaller than him. 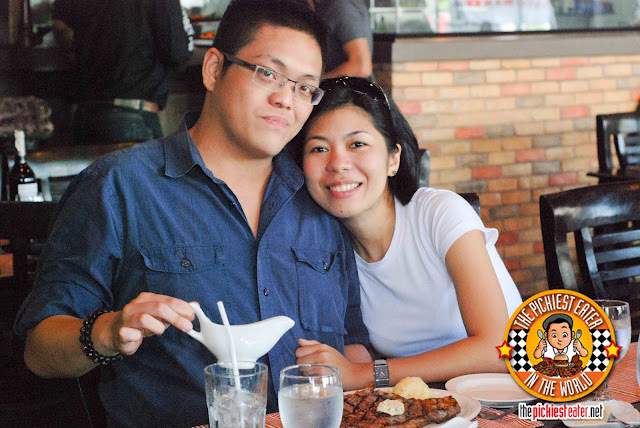 You'd have to slice him in half to make two normal sized people out of him) so I settled for the 8oz Rib Eye Steak (P1,050.00). For me, the beauty of a Rib Eye Steak is in its marbling, and this Corn-fed Angus Beef cut had it down beautifully. I was worried that it would be one of those steaks where I feel like I have to labor through the lean meat part just to get it out of the way, and THEN eat the sides rimmed with fat just to make sure I enjoy the steak to its fullest. Mine was cooked to a perfect medium well. But the steak itself had these amazing linings of fat scattered around it, that every bite ensured that you got a mouthful of juicy awesomeness in it. It might not have been at the level of Gustavus (My barometer for awesome steaks), but it was pretty close, and at a more attainable price (for me, at least). I liked the size of the steak that I got, because I didn't feel to heavy afterwards (I knew I still had a whole lot of walking around ATC to do). My only comment would be, and this is a minor one, is that they should find a way to have the slice of herb butter not be so cold when placed on top of the steak, so it melts immediately. Rina ordered the 5oz Sirloin Steak (P690), which was perfect for her since she has been craving for steak on sizzling plates for the past couple of weeks. True to form, she plowed through it like a pro, and was rather enamored with the Steak Sauce that Wooden Horse . 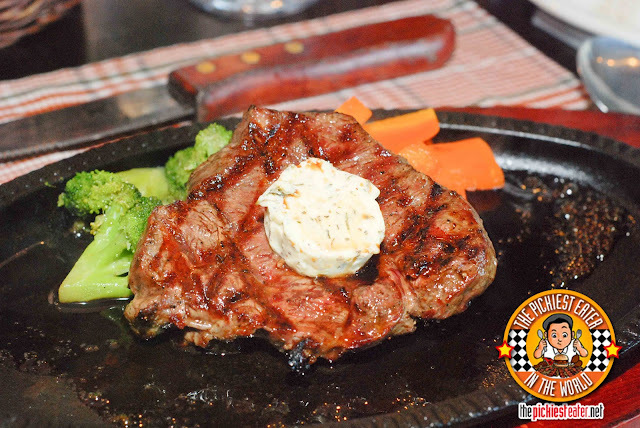 Instead of the usual mushroom or gravy sauce that other steak house gives, Wooden Horse concocted their own accompaniment to its steaks. I'm not exactly sure what it is, but it seemed like the drippings of the steak, mixed in with worcestershire sauce or something. Whatever it was, it really worked, because it brought out the flavor of the meat, instead of overpowering it like gravy tends to do. Rina's was also cooked wonderfully to a medium well temperature. Rina's only negative comment? "Bitin" (Not enough). 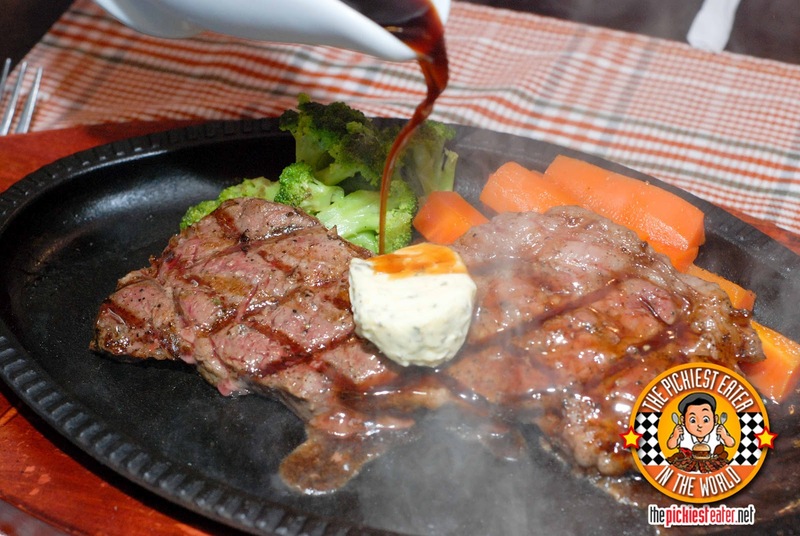 Lia ordered their 6oz Top Blade Steak (P360). I didn't try it, but i probably wouldn't have ordered it myself because it looked a lot leaner than I would preferred. 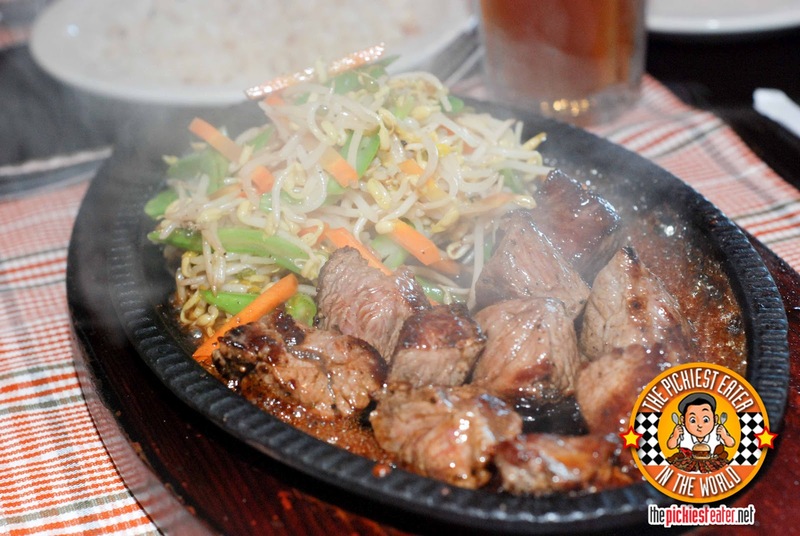 Melay had the 5 oz Dice Cut Steak (P350) which came with a generous amount portioning of bean sprouts as a side dish. Again, it looked good for me, but I wouldn't have ordered it myself. All those bean sprouts looked like a waste of plate space for me (hehe). Shrimp in a steak house! 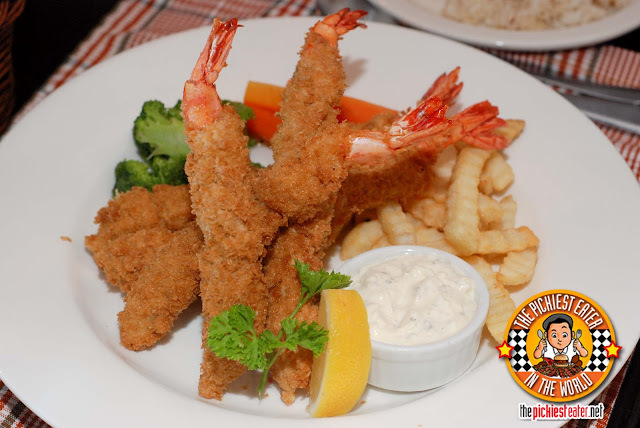 Aiko ordered the Deep Fried Breaded Shrimp (P250) with tartar sauce for herself. Now, I didn't try the dish myself, but I know this - Aiko is a rather thin girl, that if you look at her, you can't imagine her downing five shrimps in succession and a side order of fries all in one sitting. But she absolutely destroyed those shrimps like they insulted her loved ones. As soon as she was done, the plate looked like something out of a "Joy Dish Washing Liquid" commercial. 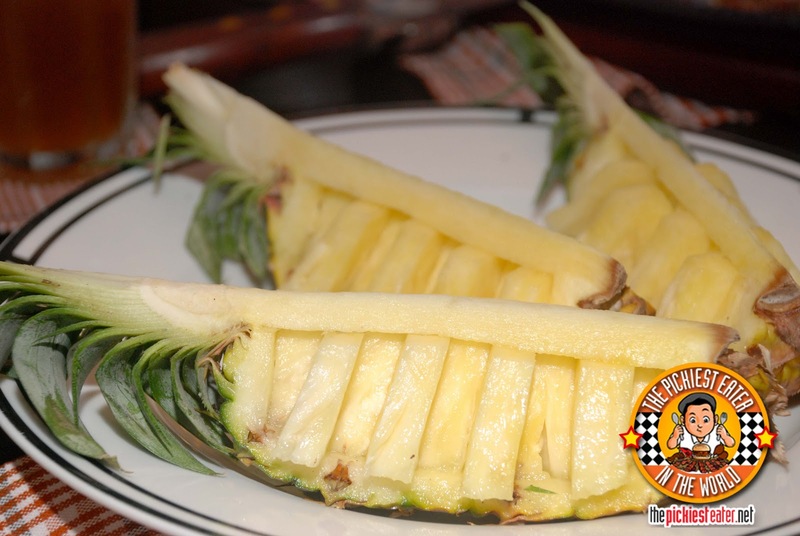 We didn't order this, but they gave us some pineapples to cleanse our palate, compliments of the Wooden Horse! We had a great time at the Wooden Horse, and I wouldn't hesitate to go back a second time.. Hopefully they let me ride the horse again! The Seiko Films of Steaks.. "If it's Angus, It must be good!" when you're basically only as tall as the bar. I had to explain to the guard that I was just following what the sign said. Group Shot! See you guys again soon! ooohhhh, that's at molito! i've always wanted to try that place, but seeing as i'd rather spend my money on clothes, shoes, and bags than food, i always found it too expensive!!! Those steaks look a bit on the lean side but they do look good and tasty! I've been meaning to try that place out too but whenever I'm in the area, I always seem to end up next door in Grams Diner. haha peter! Grams has some pretty good stuff too, so I don't blame ya! Thanks for dropping by! 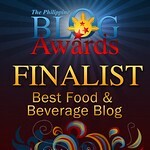 I really enjoy reading your blog and your wife's blog(s)! Do they have acoustic band playing? not when I was there, anonymous! Hello Richie, it is an honor for us to have you dine at Wooden Horse Steakhouse. 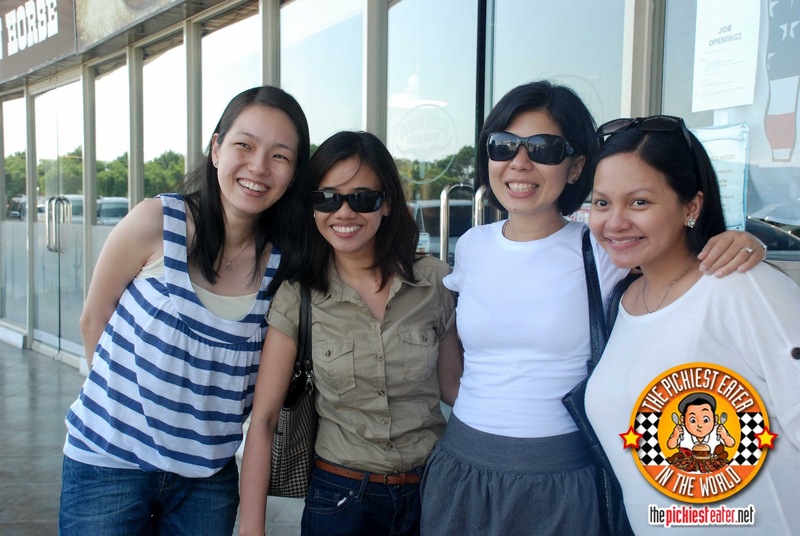 We would like to say thank you (even if its too late) for sharing your pictures and good reviews for us. And also thank you for making this blog, it give us the passion to work more hard for our customers.Till we see you again :) God Bless! Great work, guys! I look forward to visiting again soon!